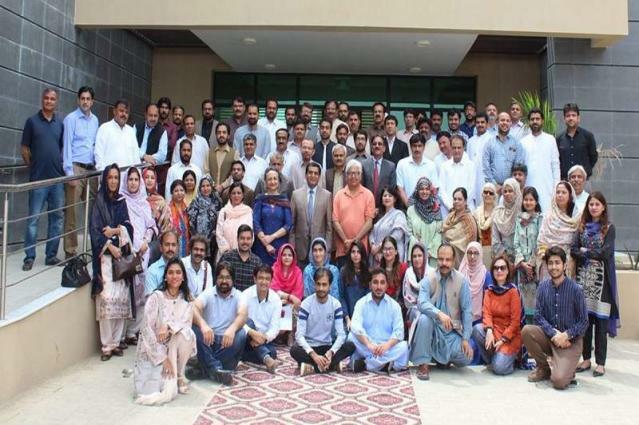 Islamabad (UrduPoint / Pakistan Point News - 17th Apr, 2019 ) Pakistan Poverty Alleviation Fund (PPAF) carried out an extensive water engagement exercise to come up with an action plan for effectively addressing water issues in Balochistan. The water engagement,held from April 09 to 16 in Balochistan comprised of field visits as well as a two-day consultative workshopat Lasbela University of Agriculture, Water and Marine Sciences (LUAWMS). As many as 86 participants, comprising water specialists and representatives from academia, civil society, government departments, and PPAF,were involved in the monumental exercise. PPAF has engaged in numerous poverty alleviation initiatives in Balochistan with a big focus on water. It recognises that it has become ever more important for attention to focus on Pakistan’s national and regional water crisis and water-related issues. Balochistan is the most water scarce province of Pakistan. It requires special attention to avert the impact of climate change, drought and disasters. Keeping in mind the water crisis and water problems in the province, PPAF planned this unique engagement with multiple actors to come up with a draft water strategy for the province, and a comprehensive action plan to address water issues. Various organisations demonstrated similar understanding in theirparticipation in the water engagement excercise, including government departments such as Pakistan Environmental Protection Agency, National Disaster Management Authority, Pakistan Council of Research in Water Resources,various local district adminstrations and organisations including ASAS, Muslim Aid, LEAD Pakistan, as well as journalists and social activists. Participating universities included University of Balochistan, University of Turbat, Lasbela University of Agriculture, Water and Marine Sciences, NED University, Mehran University, and Quaid-e-Azam University. For the first activity, seven groups were formed to cover agro-ecological zones across Balochistan for field exposure and observation. Field trips were conducted in five zones divided into deserts, plains, the coastal areas, the Quetta valley, and the North and South Highlands. Areas visited include Loralai, Zhob, Mastung, Khuzdar, Kharan, DeraMuradJamali, Lasbela, Turbat, Quetta, Pishin, Chaman, and Ziarat. Each group spent three to four days in the field, observing and noting issues pertaining to water in the province, including traditional water transport systems, interventions by PPAF, the government, and donors, and possible solutions. After the field visits, the teams congregated at the Lasbela University of Agriculture, Water and Marine Sciences along with other invitees to present their field learnings and devise respective ways forward. Participants talked about drinking water for all, ground water management, surface water storage and management, limited agriculture with efficiency and value chain, rangeland management and water for livestock. It was recommended by participants and experts that two more themes, women and water, and water for coastal and marine areas must also be studied. The workshop concluded with closing remarks from Vice Chancellor of LUAWMS,Professor Dost Muhammad Balochand vote of thanks from Dr.
Muhammad Arshad, Team Lead from LEAD Pakistan. Detailed research will be carried out by specialised academic institutions in Balochistan. Action plans will also be developed by PPAF for livelihoods development around the identified themes, in terms of asset transfers, community infrastructure, interest free loans, linking to microcredit loans etc. Ms. Simi Kamal, Senior Group Head, Grants Operations, PPAF, also addressed the partakers of the workshop, emphatically thanking them all for their joint effortsin the water engagement exercise. ”No part of this extensive project would have been possible without all our esteemed participants, in your own momentous ways, contributing towards this much-needed fight against the water crisis in Balochistan. With determination and solidarity, we will make an impact.” PPAF’s pursuit in resolving the water crisis in Balochistan will continue. The leveraging, consultation and synergies amongst government line departments, educational institutions, universities, the think tank on rational use of water, water professionals and other relevant stakeholders’ involvement will also play a pivotal role in developing more effective and innovative approaches and initiatives.